If you have a basic understanding of Edward Snowden’s story, don’t expect to learn anything new by watching this dramatised version. 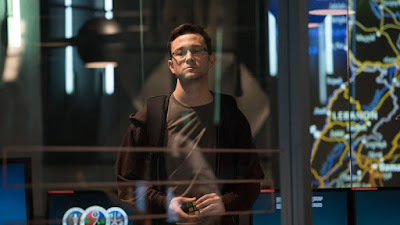 Director Oliver Stone had everything to make this film thrilling by immersing audiences into the psyche of Edward Snowden (Joseph Gordon Levitt ), a high level intelligence contractor who leaks millions of classified documents on how the NSA illegally spy on individuals without their consent or knowledge. There were opportunities for gripping audiences by exploring the moral battles being fought by US Intelligence workers, shedding light on the secret yet ‘legal’ Foreign Intelligence Surveillance Courts or even uncovering the power and influence possessed by those within the hierarchy of these organisations. However, what we do get is a film that touches interesting points but provides no depth. Stone’s ‘dramatisation’ seems to hit its crescendo within the first five minutes, where we see Snowden locking himself in a hotel room with three hand-picked journalists, ready to hand over the secret documents. But, from then on, it is flat and dragged out. The recurring theme that US Intelligence Agencies spy on all of us is portrayed through many long-winded examples that it begins to bore the audience. The inclusion of Snowden’s girlfriend adds no value and is all too predictable, especially when focusing on the impact his job has on their relationship. As far as casting is concerned, for me no one stand out in the slightest, and let’s not even begin to delve into what Nicolas Cage is doing playing a mentor to potential intelligence agents. The film does however end with an actual clip of Edward Snowden, conducting a public interview to a large audience from his new home in Russia. For me, this was a rare scene where you could actually get to know the character and should have been longer! One should not forget that an incredible story underpins this movie. It is the ultimate David vs. Goliath battle which could have captivated millions of cinema-goers around the world. It is a shame Oliver Stone’s representation doesn’t do Snowden justice. You might just find Wikipedia’s version a lot more fun ! SNOWDEN has a running time of 134 minutes and is rated R. The movie played Toronto and London 2016. The movie opened earlier this year in Israel, Bulgaria, Estonia, Hungary, Sweden, Turkey, the USA, Vietnam, Brazil, Germany, Croatia, Portugal, Finland, Lithuania, Denmark and Norway. It opened earlier in October in Spain. It opens in Spain on October 7th, in France on November 2nd, in Greece on November 3rd, in Belgium on November 9th, in Poland on November 11th and in Italy on December 1st.